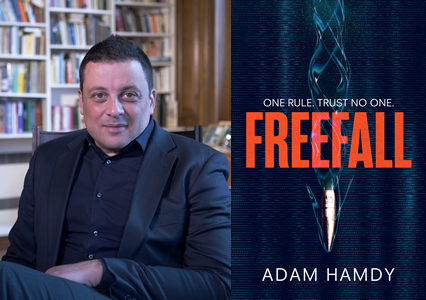 Join us for an evening in the company of author and screenwriter Adam Hamdy as he talks about his new thriller, Freefall – the high octane follow-up to his first novel Pendulum. JOHN WALLACE IS A TARGET. THERE ARE ONLY TWO PEOPLE HE CAN TRUST. DI Patrick Bailey is still reeling from the murder investigation that nearly cost him his life. FBI Agent Christine Ash is hunting a serial killer with a link to an unfinished case. HE MUST FIND THE TRUTH. BEFORE THE KILLER FINDS HIM. James Patterson hailed Adam Hamdy’s first PENDULUM novel as ‘one of the best thrillers of the year’ saying he read it in ‘one gloriously suspenseful weekend’. If you like your thrillers as unexpected as a sniper’s bullet, this is the event for you. Tickets: £5 (redeemable against a signed copy of Freefall). Includes a glass of wine / soft drink on arrival.